Do we ever really know what is going on in people’s minds? In all honesty, the answer is probably “No”. However in the Theatre Re’s “Blind Man’s Song” at Jackson’s Lane, we not only explore this idea but take it to a new level of intensity. Conceived and directed by Guillaume Pige, “Blind Man’s Song” provides an extraordinary and emotionally charged glimpse into the mind and imagination of a blind musician (Alex Judd) as we accompany him through his memories and fantasies. It all starts with a chance meeting between himself (played separately by Guillaume Pige) and a young lady (Selma Roth) on a normal day that is about to become magical. The moment of their meeting, with the knock to the arm and a hanky moving from ‘her’ to ‘him is superbly acted out in ‘normal’ time, rewind, slow motion, rewind, focus on the moment of touch, rewind, focus again, and again – as if we were watching a movie with our finger on the controller alternating between the rewind and play buttons – being re-lived and appreciated for the special moment it is. The story then moves on taking the relationship between the two of them into the musician’s mind and the world between reality and fantasy. Played out as a cross between mime and dance – sometimes it was impossible to tell where one form ended and the other began – this is a tremendous show. The music, composed and performed by Alex Judd, was so intriguing. Using, what sounds on paper a simple delivery method, Alex played a recurring theme on a piano or violin that then carried on being heard as he added another musical section, building each tune layer by layer until there was a ‘whole piece’ being played on the stage. I realise my description there is a bit vague but I can say the music was fantastic and complex in its performance in a way I’ve never encountered before from one musician and it really is something that has to be seen to be fully understood and appreciated. Guillaume and Selma’s movements were wonderfully choreographed – though their lack of faces was initially highly disturbing – translating the thoughts and images of the blind man with no words to an audience captivated by the unfolding story we were living with them. The lighting by Katherine Graham worked superbly to move ‘scenes’ around and focus energy where it was needed, and the highly flexible bed on wheels was almost like another member of the cast as it glided across the stage transforming into various locations, and even performing magic tricks, the first of which completely stunned me. One of the most amazing things for me about this show was the effect on the audience. January is a terrible time to go to the theatre. Coughs, colds, flu and all manner of noises from the auditorium tend to distract from whatever is happening on the stage. But I can honestly say from the time the lights went down until the tumultuous applause at the end, the capacity audience was silent – not a cough or splutter heard throughout the show. I also experienced something that rarely happens, hearing the utter silence when a piece of music ends – no fidgeting or adjusting sitting position sounds from anywhere – as everyone concentrated on the spellbinding story before us. I’m going to be honest here. When I first heard that this show was part of the 2015 London International Mime Festival I had a dread idea in my head that I was going to see some stripy jumper wearing Marcel Marceau clone trying to get out of an invisible box – that was pretty much my only experience of mime. Instead I saw a wonderful and emotional love story from the mind of a man that had never seen the light of day played out in front of me and I was completely mesmerised the whole time. Fantastic! The best and most beautiful things in the world cannot be seen or even touched, they must be felt with the heart (Helen Keller). As an old blind man takes unsteady steps around his room, he recalls an encounter that triggers his memories and imagination. And, a story of love, courage, hope and unquenchable vision unfolds. 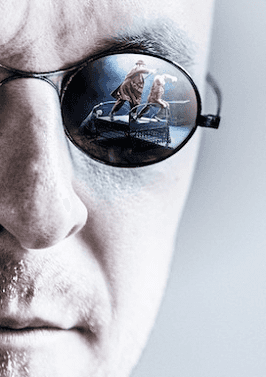 Theatre Re has a gorgeous aesthetic quality that enchants the audience (A Younger Blind Man’s Song is a tale about one man’s rage against his world of darkness. Inspired by the paintings of René Magritte, the dead-end world of Samuel Beckett and interviews with blind and visually-impaired people, it uses theatre, mime and original live music to explore the power of imagination in seeking wisdom beyond our senses. With no words, Blind Man’s Song witnesses the power of the body to communicate. Established in 2009, Theatre Re is a London-based international ensemble that creates vibrant and emotional work on the edge of mime and theatre. Its two previous productions, The Gambler and The Little Soldiers, have both toured widely following successful Edinburgh Fringe seasons. Theatre Re is an associate company of South Hill Park Arts Centre. All performances (except 21st January) will be audio described by VocalEyes.